'You might even have a 'nation in grave danger' story by the summer of 2019,' notes Shekhar Gupta. Nobody knows who invented the description 'useful idiots' although Lenin is widely credited with having used it for liberal non-Communists who became his benign spokesmen. American author William Safire said he found no evidence of this Lenin link. It has endured pretty much as any convenient smart line attributed to Confucius, Kautilya or Sun Tzu. In India, for two decades, intellectual backers of the Hindutva campaign have used this for Left-leaning, liberal, urban intellectuals. The ongoing project to rename them Urban Naxals has, however, met with limited success yet as the great war of rival hashtags rages. It might confuse warriors on both sides when I say this, but evidence is now emerging that Urban Naxals or not, the Bharatiya Janata Party/Rashtriya Swayamsevak Sangh has probably been right in calling them useful idiots. But there is one important twist. They aren't the useful idiots of the 'Great Indian Revolution', of which only tiny vestiges survive harmlessly in a couple of central universities, and somewhat more dangerously in tiny tribal patches such as Bastar. In them, the BJP has found its own useful idiots. There is no such thing as an Urban or Rural Naxal. A Naxal is a Naxal and a Maoist too. To be either isn't at all criminal. No law, not even the UAPA (Unlawful Activities Prevention Act) can put an Indian in jail for any beliefs, or stating those. You could even say in public you believe India is in illegal occupation of Kashmir or that our democracy is a sham and a savarna conspiracy. Can a government lock you in jail? No. The BJP's problem is different. Whatever its claims, it knows better than its delivery on its promised growth-and-glory agenda has at best been about B-plus, no more. It needs to seek a vote against 'somebody', somebody really dangerous so people forget their failed expectations, and vote for national survival. The original formula of Muslim-as-enemy is frayed. It would have been possible only if the Muslim-means-Pakistani-means-Kashmiri separatist-means-terrorist-means-LeT/Al Qaeda/ISIS equation was sustainable. It doesn't seem so. Partly because India's mainland Muslims have stayed calm. Second, because not all Hindus are so scared of Muslims as to overlook their other determinants of identity, especially caste. And third, to sustain that tension, you need constant fireworks on the LoC, with the grand finale of a 'mega' surgical strike. The Chinese have now indicated clearly enough they won't look the other way if their 'iron' friend Pakistan is molested. And nobody can count on Donald Trump's America any more. Not even NATO (the North Atlantic Treaty Organisation) or Japan or South Korea. You need to, therefore, invent another enemy to India's existence. Maoism it could be. Better still if you could somehow link it to Islamism. All malevolent forces, global and internal, combining to plot the destruction of India and you are talking about jobs? Where's your patriotism? You call it whatever 'ism', but what's playing out is pure politics. Since Rajiv Gandhi's decline in the late 1980s, one question has determined who rules India: Can the BJP/RSS use religion to reunite what caste divided? L K Advani achieved it with Ayodhya. But in 2004, it had run out of oomph. Narendra Modi did better. Just his persona and track record were a magnet for the Hindu voter. Throw in the twin promise of strong government and growth and there was a sweep. He isn't about to risk going to the voter with his B-plus report card. There is need to invent another enemy. If you can add Maoists to Muslims, the tukde-tukde thread will tie in nicely. You might even have a 'nation in grave danger' story by the summer of 2019. Just the word Maoist has limitations in scare-value. Too many of us have seen Maoists who sounded perfectly harmless in colleges. Naxal sounds more threatening because Naxals carry arms. But they are out of sight, out of mind. They are not on our TV screens or Twitter. You can't scare a voter in Maharashtra or Madhya Pradesh in their name. There comes the Urban Naxal. Rewind this movie back to when the tukde-tukde stuff first surfaced in JNU. There was to be an event to express solidarity with the people of Kashmir. The event was titled 'The Country Without a Post Office', inspired by a poem of Agha Shahid Ali, a wonderful Urdu poet, especially adored by the intellectual Left. First, leaflets emerged saying it was also a gathering to debate and support Kashmir azaadi. Then the video with 'Bharat tere tukde honge, inshallah-inshallah' slogans emerged. Two Left students, one more radical than the other, and a Muslim too, were charged with fabricated cases of sedition. More videos emerged. A professor justifying to her applauding students at a JNU square the Kashmiri demand in azaadi and asserting that 'the entire world agrees that India is in illegal occupation of Kashmir'. A new script was being readied: Radical, intellectual Left in cahoots with anti-national Muslims in a plot to break up India. Urban Naxals and separatist Muslims joining hands, to bring distant crises of Kashmir and Bastar to New Delhi, Hyderabad, Mumbai and Pune. With JNU as the villain ka adda. The radical intellectual Left, by jumping on the Kashmiri separatist bandwagon, has done half the job. Trust Narendra Modi and Amit Shah with friendly TV channels to do the rest. A new, nation-in-danger myth is emerging. India isn't made of porcelain. It can't be broken up by slogans, graffiti, articles or poetry and a handful with guns in the tribal hinterland and Kashmir. But to voters not particularly committed to either side, it may be of interest. In a polarised environment, just a couple of per cent ultimately count in our winner-takes-all system. It is one thing to defend the freedom of thought of a Left intellectual to back the armed Naxal cause and plebiscite in Kashmir -- you can say what you want as long as you don't pick up the gun. Then it gets fuzzy. Because those you claim to speak for use guns, kill and die. Then you accept hospitality from a known Pakistani-Kashmiri-ISI (Inter-Services Intelligence) operative (Ghulam Nabi Fai), convicted and sentenced in the US as such and, instead, hail him as a Kashmiri patriot. It helps the State call every Kashmiri a traitor. Or if you think you can bring about the Revolution with 20 gelatine sticks and five fuses. There is a touching belief among the global Left that radical Islam will now fight and defeat American imperialism and other such evils that the Soviet Union failed. Romantics are replicating it in India too. But those they claim to fight for, Kashmiris and Bastar tribals, are dying, unknown, unsung, unmourned and undefended, expendable gun-fodder. The moment you pick up arms, the State has the justification to kill you. It will win. Not just because it is much stronger, but because public opinion, overwhelmingly, will support it in this 'virtuous' war. Very few of us Indians are so intellectually evolved that we will look at the 'root causes' of anybody going to war with India. You will meanwhile get your reprieve from courts, and rightly so. 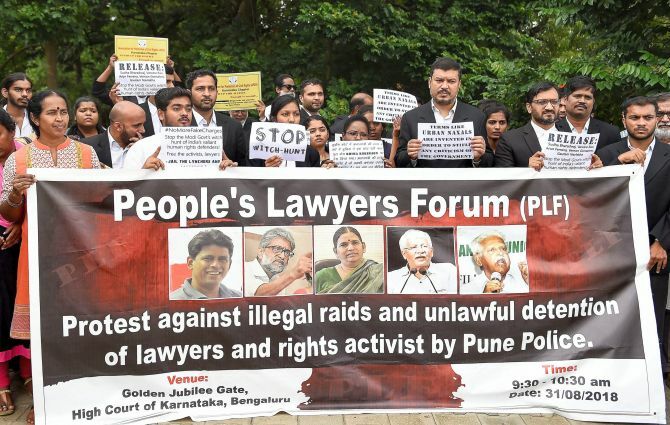 The Modi government will certainly lose this round, legally and morally. But they won't bother. This isn't what their overnight 'Operation Red Hunt' was about. You figure out who benefits from your 15 minutes of fame with revolutionary romance. He, or rather they, should be sending you giant thank-you cards, sealed with kisses and tied with holy kalava thread. For them, you are useful idiots, for their cause, not the Left's. If Lenin did indeed invent the phrase, he'd fret.